What Are the Best Fertilizers to Use to Get Large Onions? In addition to proper fertilizing and watering techniques, onion variety selection is an important factor in growing large onions. Long-day onions grow well in Northern regions, while short-day onions produce large bulbs in the South. The number and size of the leaves at maturity predicts how large the onions will be. More leaves means larger onions. Plant onions from seed or sets in early spring. Before planting onion transplants or sets, amend the soil with 3 inches of compost, which improves soil texture and provides some slow-release nutrients. Add 1/2 cup balanced fertilizer per 10 feet of row and till the amendments to a depth of 8 inches. Use 1/2 cup super phosphate fertilizer instead of balanced fertilizer if planting onion seed. Super phosphate acts as a starter fertilizer, encouraging strong, early roots. Onions need a steady supply of nitrogen to form large bulbs. Side dress growing plants in early and midsummer with 1/2 cup nitrogen-based fertilizer. Use ammonium sulfate if your soil is alkaline because this fertilizer lowers the pH slightly. Ammonium nitrate works well for gardens with acidic soil. Spread two or three shovelfuls of compost among the onions instead of fertilizer and dig it lightly into the soil. Take care not to nick the bulbs with the shovel. Read package labels carefully and choose a high-quality compost made from manure and composted vegetable material. Avoid composts that contain biosolids or sludge in the vegetable garden. Don't apply fertilizer after midsummer. Late applications of fertilizer encourage new, soft growth and the onions won't keep as well. 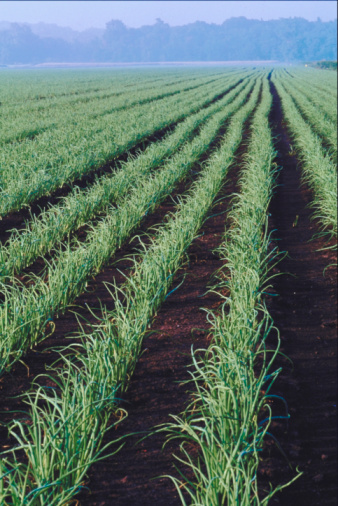 In addition to adequate fertilizer, onions need evenly moist soil to grow large. Mulch the ground with untreated grass clippings to conserve moisture. Spread 1/4 inch grass clippings over the soil each week, allowing the clippings to dry before adding more. How Much Water Does it Take to Grow Radish Seeds?